Take a page from a Viennese cookbook and serve up your pancake breakfast or brunch with European flair. 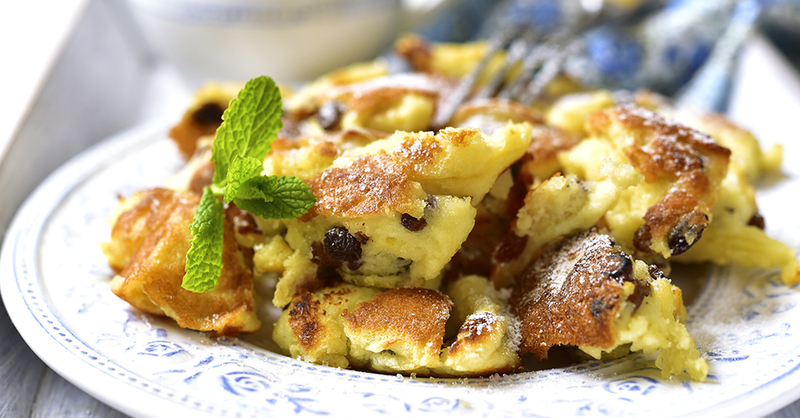 We’re obsessed with these tender bites of golden pancake, which features a delicate texture, a hint of lemon zest, rum-soaked raisins and the sweet dusting of powdered sugar. Enjoy the rich flavor and fluffy texture of these bite-sized pancakes just as they are, or pair them with a side of applesauce, plum sauce or fruit compote. Give your family the royal treatment by serving this delicately delicious dish also known as the Emperor’s Trifle. Place raisins and rum in a small, glass bowl and microwave for 25 seconds. Let sit 20 minutes so raisins absorb some of the rum. In a large bowl or mixer, beat egg whites until soft peaks form. Beat in a pinch of salt. In a separate bowl, cream together egg yolks and sugar until thick and ribbony. Gradually beat in milk, flour and lemon zest. Fold in beaten egg whites, then let sit for 10 minutes. Melt butter in a large pan or skillet over medium-high heat. Once hot, add batter and spread it around the pan, then sprinkle raisins on top. Cover and cook for 10 minutes. Flip and continue cooking. Break up pancake mixture into bite-size pieces and cook until golden brown.